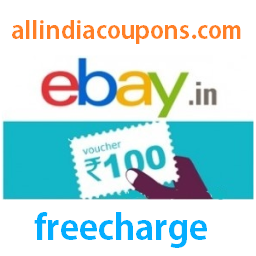 Now do a recharge on Freecharge and get 100 Rs Ebay coupon free. You can redeem this Ebay coupon on any shopping of 110 Rs or more. So, you will save 100 Rs on ebay with this Freecharge Coupon. Select the Coupon from the list, Now ebay 100 Rs coupon is also available. You will get a 100 Rs Ebay.in coupon on your Email. Don't miss any other Deal or Offer. Subscribe our Newsletter by visiting our Homepage.